Purpose: Use this document as a reference for retiring assets in ctcLink. From time to time, assets are disposed of, through sales, trade-ins, scrapped, etc. 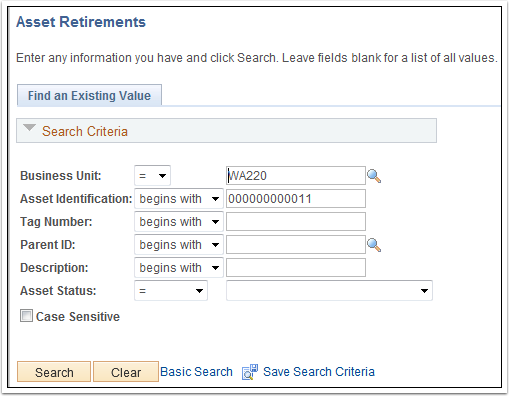 To update ctcLink Asset Management for these disposals, use the Retirement function. If it did not default, enter or select the appropriate business unit in the Business Unit field. Enter the asset information in the Asset Identification field. Enter any other information that you have and then click the Search button. Use the Retire As drop-down button to choose the appropriate type of retirement transaction. Comment and attachment functionality enables you to add supplemental information for an asset. The comment and attachment feature can be use with: Cost-Adjust Transfer Asset, Book - Depreciation, Asset Disposal, Transaction Reversal, ARO Measurement, Define Asset Operational Information, Cost History, Asset Book History, and Fluid Approvals for Asset Transfers, Inter Unit Transfers, and Adjustments. Enter the amount of any costs to remove the asset from your possession in the Removal Cost field. Enter the amount of any proceeds for the transaction in the Proceeds field. Select the proper Trans Code to generate proper accounting treatment. You can find the funding source on the By Chartfield tab. If the Fund is 997, use Governmental Funding, else choose Proprietary Funding. If you get an error message, you may have forgotten to change the Trans Code. Only Governmental Funding and Proprietary Funding are valid Trans Codes. 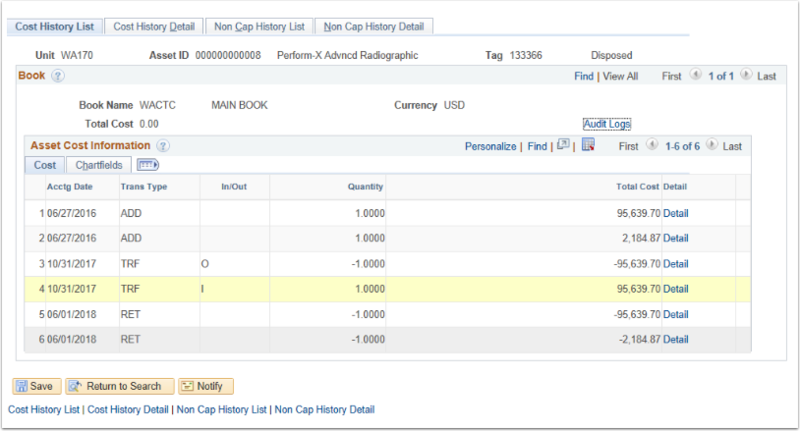 Next, navigate to the Cost History List page to review the asset cost history information. 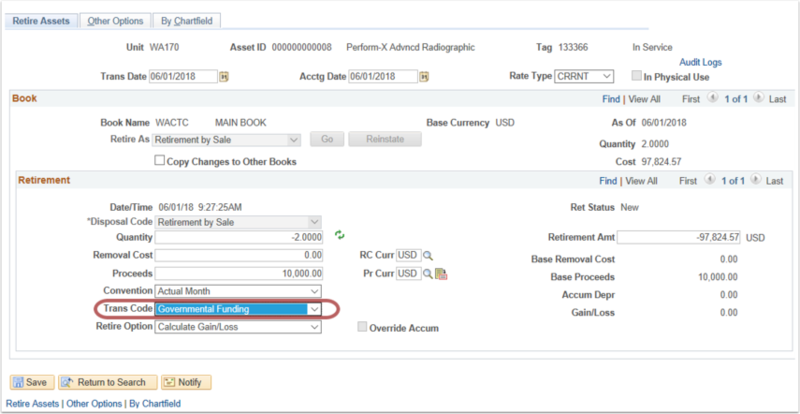 Use the Cost History List page to view the history of an asset's transactions. Note that the page displays the total quantity and cost adjusted for this asset. The quantity and cost are adjusted in all cost rows. Retired assets still need to be processed through Depreciation Calculation, Create Accounting Entries, and Close Depreciation. Use the comment and attachment feature to add attachments or necessary comments.